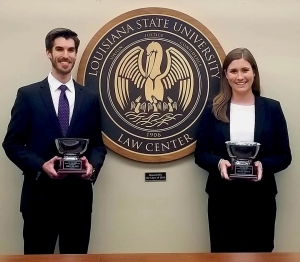 LSU Law students Michael Maldonado and Laura Marcantel won the Fall 2018 Robert Lee Tullis Moot Court Competition on Oct. 26 at the LSU Law Center. Maldonado and Marcantel successfully argued their case in the final round judged by Judge John W. deGravelles, United States District Court for the Middle District of Louisiana; Elizabeth Murrill, Solicitor General for the Louisiana Department of Justice; and William J. “Will” Crain, Louisiana Court of Appeal for the First Circuit. Maldonado and Marcantel, along with finalists Katelyn Bayhi and Taylor Ashworth, argued whether a state university’s firing of a professor over her non-university-sanctioned blog post constitutes a violation of her free speech rights. The teams of Marcus Sandifer/Indigo Diekmann and Daniel Bosch/William Heaton were semifinalists in the Tullis Moot Court Competition. Named in honor of the late Dean Emeritus of the LSU Law Center, the Robert Lee Tullis Competition has been a tradition of honor since 1936. The Tullis Competition provides opportunities for development of appellate advocacy skills for all second-year students.